Young Robin are progressing so fast that it's exciting to watch – anticipating what they're going to do next, only to have those expectations surpassed. A band with an innate knack for hooks, Young Robin craft a beautiful sound that is somewhere between blissful indie and dance floor anthems. 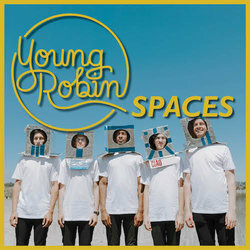 Fittingly, their latest single, the mesmerising Spaces, is both. Built upon a rhythm you can't sit still to, Spaces is a delight for the ears with its perfectly-placed layers of delay-soaked guitar, bass, and effortlessly smooth vocals by both Jed Begho and Ben Teune. Playful and euphoric, Spaces feels like summer in Perth – as if the band have distilled the excitement of their beautiful hometown down into a singular burst of energy. This is due in no small part to award-winning producer Andy Lawson, who has sculpted the Transitions EP masterfully – capturing the band's energy like lightning in a bottle. Transitions is the band at its best and the remixed single Spaces elevates their sound to a new level.